The eponym Monteggia fracture is most precisely used to refer to a dislocation of the proximal radioulnar joint (PRUJ) in association with a forearm fracture, most commonly a fracture of the ulna. 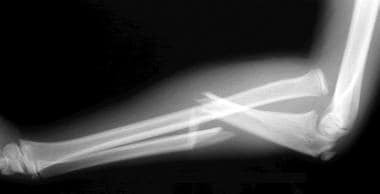 These injuries are relatively uncommon, accounting for fewer than 5% of all forearm fractures. The mechanism of injury is most often a fall on an outstretched hand. Some injuries associated with radiocapitellar dislocation (such as the transolecranon fracture-dislocation of the elbow) are mislabeled as Monteggia lesions, when in fact the PRUJ remains intact. 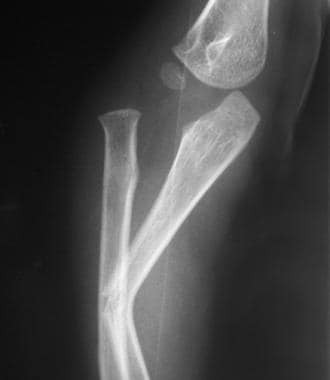 The Monteggia lesion is most precisely characterized as a forearm fracture in association with dislocation of the PRUJ. The radial head dislocation may not be apparent and will possibly be missed if the elbow is not included in the radiograph. 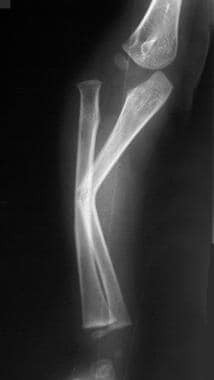 Whenever a fracture of a long bone is noted, the joints above and below should be evaluated with radiographs in orthogonal planes (planes at 90° angles to each other). If one of the forearm bones is injured, injury should be looked for in the other bone and in associated joints of the forearm, elbow, and wrist. This principle also applies to a Galeazzi fracture, which is a fracture of the distal radius with concomitant dislocation of the distal radioulnar joint (DRUJ). Separate radiographs should be taken of the elbow. The radial head should point towards the capitellum on all radiographs of the elbow. For patient education resources, see the Breaks, Fractures, and Dislocations Center, as well as Broken Arm, Broken Elbow, and Elbow Dislocation. The annular and radial collateral ligaments stabilize the radial head. These ligaments stretch or rupture during radial head dislocation. The radial head articulates with the humeral capitellum and the radial notch of the proximal ulna. The radius and ulna are closely invested by the interosseous membrane, which accounts for the increased risk of displacement or injury to the radius when the ulna fractures. The distal ulna and radius also articulate at the DRUJ. The ulna provides a stable platform for rotation of the radius and forearm. The ulna and interosseous membrane also may provide stable platforms for dislocation of the proximal radius, leading to the Monteggia fracture. The posterior interosseous nerve travels around the neck of the radius and dives under the supinator as it courses into the forearm. The median and ulnar nerves enter the antecubital fossa just distal to the elbow. The close proximity of these nerves may lead to injuries when a Monteggia fracture occurs. Neural injuries are generally traction injuries and result from stretching around the displaced bone or from energy dispersed during the initial injury. The forearm structures are intricately related, and any disruption to one of the bones affects the other. The ulna and radius are in direct contact with each other only at the PRUJ and the DRUJ; however, they are unified along their entire length by the interosseous membrane. This allows the radius to rotate around the ulna. When the ulna is fractured, energy is transmitted along the interosseous membrane, displacing the proximal radius. The end result is a disrupted interosseous membrane proximal to the fracture, a dislocated PRUJ, and a dislocated radiocapitellar joint. Radial head dislocation may lead to radial nerve injury. The posterior interosseous branch of the radial nerve, which courses around the neck of the radius, is especially at risk, particularly in Bado type II injuries. Injuries to the anterior interosseous branch of the median nerve and the ulnar nerve also have been reported. Most nerve injuries are neurapraxias and typically resolve over a period of 4-6 months. Splinting of the wrist in extension and finger range-of-motion (ROM) exercises help prevent contractures from developing while the patient awaits resolution of the nerve injury. In 1814, Giovanni Battista Monteggia of Milan first described this injury as a fracture to the proximal third of the ulna with associated anterior dislocation of the radial head. Interestingly, he described this injury pattern in the pre-Roentgen era solely on the basis of the history of injury and the physical examination findings. However, this particular fracture pattern only accounts for about 60% of these types of injuries. Bado type I lesion. This is the most common type of Monteggia fracture. Bado type II lesion after open reduction and internal fixation. Bado type III lesion with lateral displacement of the radial head. The Bado classification is based on the recognition that the apex of the fracture is in the same direction as the radial head dislocation. Monteggia fractures are primarily associated with falls on an outstretched hand with forced pronation. If the elbow is flexed, the chance of a type II or III lesion is greater. In some cases, a direct blow to the forearm can produce similar injuries. Evans in 1949  and Penrose in 1951  studied the etiology of Monteggia fractures on cadavers by stabilizing the humerus in a vise and subjecting different forces to the forearm. Penrose considered type II lesions a variation of posterior elbow dislocation. Bado believed that the type III lesion, the result of a direct lateral force on the elbow, was primarily observed in children. In essence, high-energy trauma (eg, a motor vehicle collision) and low-energy trauma (eg, a fall from a standing position) can result in the described injuries. A high index of suspicion, therefore, should be maintained with any ulna fracture. Monteggia fractures account for fewer than 5% of forearm fractures, with published literature supporting figures in the range of 1-2%. [11, 12] Of the Monteggia fractures, Bado type I is the most common (59%), followed by type III (26%), type II (5%), and type IV (1%). Monteggia fractures are one third as common as the more familiar Galeazzi fractures. In a retrospective study on the functional and radiologic long-term outcome of open reduction and internal fixation (ORIF) in 11 skeletally mature patients with Bado type 1 Monteggia fractures, Guitton et al found that the mean arc of elbow flexion increased from 110º at early follow-up to 120º at late follow-up. The mean arc of forearm rotation increased from 145º to 149º. The mean Broberg and Morrey score increased from 89 points to 94 points, and the median Disabilities of the Arm, Shoulder, and Hand (DASH) score was 7 points at long-term follow-up. In 17 of the 22 patients, the radial head remained in a completely reduced position, and it was subluxated in five patients. Osteoarthritic changes were seen at the radiohumeral joint in four patients. Radiographically, there were 15 good results, seven fair results, and zero poor results. A good radiographic result was seen in all patients who underwent open reduction within 3 years after injury or before reaching 12 years of age. Datta et al conducted a prospective, longitudinal study of 21 children with Monteggia fracture with dislocation (18 type I, three type III), all of whom were treated by modified Hirayama corrective osteotomy of the ulna with wedge bone grafting, restoration of bone length, reconstruction of the annular ligament using the Bell Tawse method, and fixation of the radial head with transcapitellar Kirschner wire (K-wire). The average follow-up period was 5.5 years. The investigators evaluated outcomes on the basis of the 100-point MEPI, radiology, and questionnaire. The mean postoperative increase in MEPI score was 30. ROM increased by an average of 30º. Subluxation of the radial head occurred in three patients; one patient experienced transient palsy of the posterior interosseous nerve; and distortion of the radial head (which had no bearing on function) occurred in three. Beutel BG. 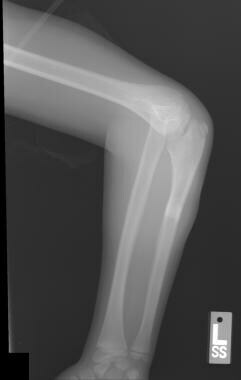 Monteggia fractures in pediatric and adult populations. Orthopedics. 2012 Feb. 35 (2):138-44. [Medline]. Watson-Jones R. Fracture and Joint injuries. 3rd ed. Baltimore: Williams & Wilkins; 1943. Vol 2: 520. Stitgen A, McCarthy JJ, Nemeth BA, Garrels K, Noonan KJ. Ulnar fracture with late radial head dislocation: delayed Monteggia fracture. Orthopedics. 2012 Mar 7. 35 (3):e434-7. [Medline]. Tan JW, Mu MZ, Liao GJ, Li JM. Pathology of the annular ligament in paediatric Monteggia fractures. Injury. 2008 Apr. 39 (4):451-5. [Medline]. Guitton TG, Ring D, Kloen P. Long-term evaluation of surgically treated anterior monteggia fractures in skeletally mature patients. J Hand Surg Am. 2009 Nov. 34 (9):1618-24. [Medline]. Ruchelsman DE, Pasqualetto M, Price AE, Grossman JA. Persistent posterior interosseous nerve palsy associated with a chronic type I Monteggia fracture-dislocation in a child: a case report and review of the literature. Hand (N Y). 2009 Jun. 4 (2):167-72. [Medline]. [Full Text]. Bado JL. The Monteggia lesion. Clin Orthop Relat Res. 1967 Jan-Feb. 50:71-86. [Medline]. EVANS EM. 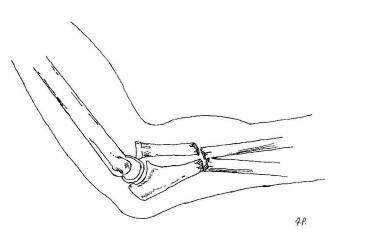 Pronation injuries of the forearm, with special reference to the anterior Monteggia fracture. J Bone Joint Surg Br. 1949 Nov. 31B (4):578-88, illust. [Medline]. PENROSE JH. The Monteggia fracture with posterior dislocation of the radial head. J Bone Joint Surg Br. 1951 Feb. 33-B (1):65-73. [Medline]. Bruce HE, Harvey JP, Wilson JC Jr. Monteggia fractures. J Bone Joint Surg Am. 1974 Dec. 56 (8):1563-76. [Medline]. Reckling FW. Unstable fracture-dislocations of the forearm (Monteggia and Galeazzi lesions). J Bone Joint Surg Am. 1982 Jul. 64 (6):857-63. [Medline]. Nakamura K, Hirachi K, Uchiyama S, Takahara M, Minami A, Imaeda T, et al. Long-term clinical and radiographic outcomes after open reduction for missed Monteggia fracture-dislocations in children. J Bone Joint Surg Am. 2009 Jun. 91 (6):1394-404. [Medline]. Datta T, Chatterjee N, Pal AK, Das SK. 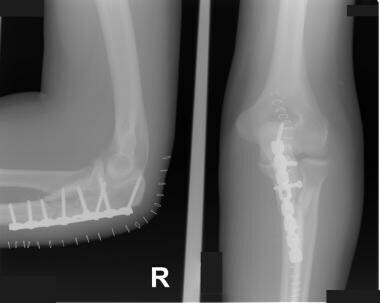 Evaluation of outcome of corrective ulnar osteotomy with bone grafting and annular ligament reconstruction in neglected monteggia fracture dislocation in children. J Clin Diagn Res. 2014 Jun. 8 (6):LC01-4. [Medline]. [Full Text]. Leonidou A, Pagkalos J, Lepetsos P, Antonis K, Flieger I, Tsiridis E, et al. Pediatric Monteggia fractures: a single-center study of the management of 40 patients. J Pediatr Orthop. 2012 Jun. 32(4):352-6. [Medline]. Wong JC, Getz CL, Abboud JA. 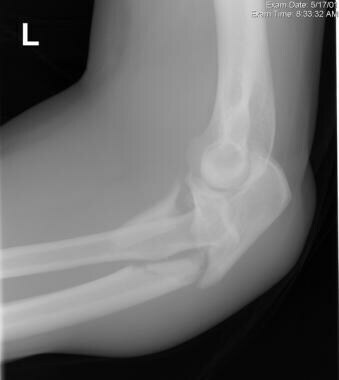 Adult Monteggia and Olecranon Fracture Dislocations of the Elbow. Hand Clin. 2015 Nov. 31 (4):565-80. [Medline]. Bae DS. Successful Strategies for Managing Monteggia Injuries. J Pediatr Orthop. 2016 Jun. 36 Suppl 1:S67-70. [Medline]. Van Tongel A, Ackerman P, Liekens K, Berghs B. Angulated greenstick fractures of the distal forearm in children: closed reduction by pronation or supination. Acta Orthop Belg. 2011 Feb. 77 (1):21-6. [Medline]. Canton G, Hoxhaj B, Fattori R, Murena L. Annular ligament reconstruction in chronic Monteggia fracture-dislocations in the adult population: indications and surgical technique. Musculoskelet Surg. 2018 Oct. 102 (Suppl 1):93-102. [Medline]. Li H, Cai QX, Shen PQ, Chen T, Zhang ZM, Zhao L. Posterior interosseous nerve entrapment after Monteggia fracture-dislocation in children. Chin J Traumatol. 2013. 16 (3):131-5. [Medline]. Di Gennaro GL, Martinelli A, Bettuzzi C, Antonioli D, Rotini R. Outcomes after surgical treatment of missed Monteggia fractures in children. Musculoskelet Surg. 2015 Sep. 99 Suppl 1:S75-82. [Medline]. Tan L, Li YH, Sun DH, Zhu D, Ning SY. Modified technique for correction of isolated radial head dislocation without apparent ulnar bowing: a retrospective case study. Int J Clin Exp Med. 2015. 8 (10):18197-202. [Medline]. [Full Text]. Delpont M, Louahem D, Cottalorda J. Monteggia injuries. Orthop Traumatol Surg Res. 2018 Feb. 104 (1S):S113-S120. [Medline].